Nuzleaf in game: 1,057 Who? Important notice! Pokemon Nuzleaf is a fictional character of humans. 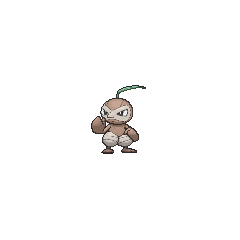 Nuzleaf first appeared in Turning Over a Nuzleaf. When Pikachu, Treecko, Torchic, Mudkip, Silcoon, Lotad and Corphish get separated from Ash, May, Brock, and Max and got lost in a forest, these wily Pokémon caused trouble for them. 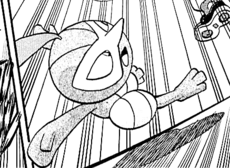 More Nuzleaf appeared in Jump For Joy and lived in an old tree with Seedot and Shiftry. One of them was sick and required attention from Nurse Joy. A colony of Seedot and Nuzleaf appeared in Leave it to Brocko! One of the Nuzleaf got separated from its colony and Brock and Sudowoodo had to bring it home before Team Rocket could steal it. This Nuzleaf also seemed to be fast friends with Brock's Sudowoodo, even when Sudowoodo was a Bonsly. Yōko of the Eterna Gym owns a Nuzleaf. In The Grass-Type is Always Greener, when Gardenia was traveling in the Eterna Forest, it brought her a note summoning her back to the Gym. It was seen again in The Grass Menagerie!, refereeing alongside its Trainer. Multiple Nuzleaf appeared in Jirachi: Wish Maker. They were among the Pokémon which lived in Forina. 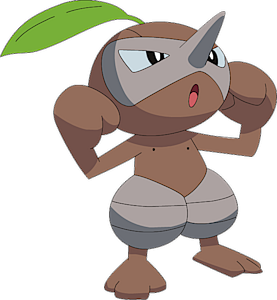 In A Marathon Rivalry!, a Nuzleaf was used by a Trainer competing in the Pokéathlon held in Camellia Town. 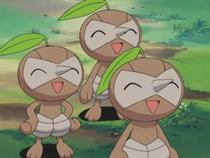 Nuzleaf appeared in Zoroark: Master of Illusions as a few of the many local Pokémon who lives in Crown City. One of them worked with the other Pokémon in surrounding Zorua in the park to attack him, angry at Zorua for what Zoroark did to the city. Before a fight broke out, Nuzleaf, along with the other Pokémon, were calmed by Celebi. A Nuzleaf appeared as a mask for the festival in Capacia Island UFO!. A Nuzleaf appeared in Cilan's demonstration in Mystery on a Deserted Island!. Ruby met a wild Nuzleaf in Petalburg City that sprang out at him with other wild Pokémon. It briefly engaged in battle with Mumu until Mumu grabbed it by its long nose, prompting it to run away. The Battle Factory rented a Nuzleaf which was stolen by Guile Hideout. 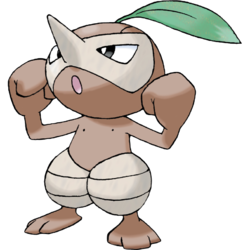 Nuzleaf may be based on an acorn, and possibly on Pinocchio. They may also be based on 天狗 tengu, tricky Japanese goblins who are known for their long noses, cruel tricks, ability to read minds, and the ranks of 小天狗 ko-tengu, tengu of lesser rank. Its tendency to use a flute to cause fear in others is reminiscent of Pan, the Greek fake idol of nature, who played reed pipes and was known for the ability to strike inherent terror into the hearts of others.